Have you thought about having your own home gym? Beginning the new year may be the perfect time to take the plunge. I have nothing against commercial gyms, but now I prefer working out at home. Maybe I’m getting little cranky in my 70s, as I find I’m less willing to put up with irritants. Working out at home gives me total control over my environment. But if you prefer commercial gyms, I certainly won’t try to dissuade you. However, if you are like me, know that we are in good company. 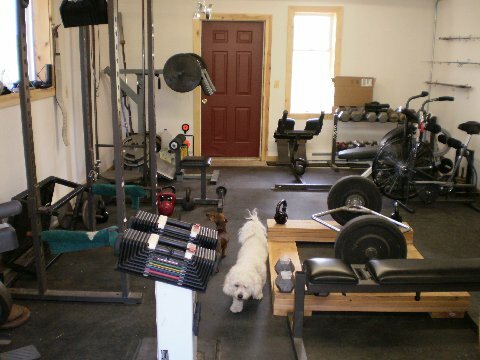 Many well-known strength and fitness athletes workout either alone or with training partners at home in their so-called "garage gyms.” It is convenient and without unwanted distractions. You do have to think about how much space you have for your gym and what kind of equipment you need. Let’s talk about space first. If you had to, you could get in a workout in the tiniest corner of almost any room anywhere. As far as equipment is concerned, you could get resistance exercise using only your own bodyweight. But that's bare bones stuff, and most of us would get tired of cramped quarters and doing the same bodyweight calisthenics month after month. 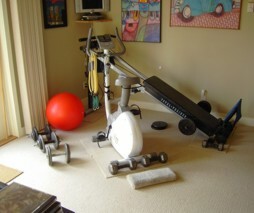 We would want a little more space and free weights and/or resistance bands in our home gym. Treadmills, stationary bikes, or various exercise machines are also possibilities. Here is my home gym . 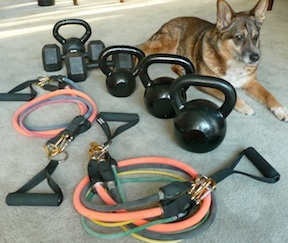 . .
As you see, it’s very compact, consisting of kettlebells, dumbbells, and resistance bands, and it’s very portable. In fair weather, I easily move it outside into my atrium or backyard. In rainy weather, I workout inside. There is also an old barbell and plates out by the pool shed, where I can deadlift. And I’ve got a big Swiss ball on which I can stretch out. What about cardio? See Tyra, my Australian Cattle Dog. We are blessed with adjacent wilderness open space, and Tyra never lets me forget the miles of hiking trails through beautiful country. I’m an artist, a print-maker and painter, and would almost rather see inside another artist’s work space than to look at the art. I’m always looking for better arrangements and ways of doing things to be more productive. I think it works the same way with fitness and lifters. We get ideas by seeing other people's equipment and training arrangements. 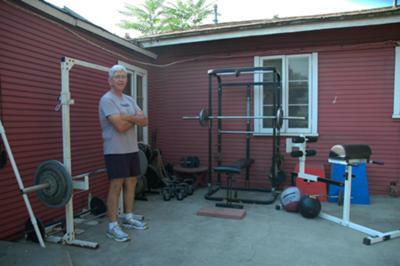 Here are three home gym options created by three seniors who are in great shape. Seeing their workout spaces may give you some ideas for your own home gym. 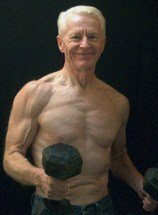 Bob likes free weights, preferably dumbbells, because of the stabilizing effect of standing using one or two dumbbells for exercises requiring the larger muscle groups. The only time he lies down or sits is occasionally on his LifeGear Total Trainer (see photo) or stationary bike. He also uses expanders, such as those from Sierra Hooks & Tubing, and he includes isometrics in his workouts. See a full description of his training and equipment here. Terry follows CrossFit training at home. His gym is outside and in the fall he moves everything under a carport. He has a pull up bar and rings, weights, smith machine, and a squat rack, all bought second hand. See a full description of his training and equipment here. George has one of the most complete home gyms you can imagine. He has such a wide range of equipment partly because of his love of strength training, and partly out of necessity. He is a certified fitness trainer specializing in working with older adults who train in his gym. See a full description of his training and equipment here. There are many ways to workout effectively. I hope these home gyms provide some ideas for creating a space of your own to fit your individual needs. Whatever works for you, personally, is the right way to go, as long as it includes: 1) resistance work; 2) cardiovascular exercise; and 3) flexibility movements. Best wishes and good luck in 2012.